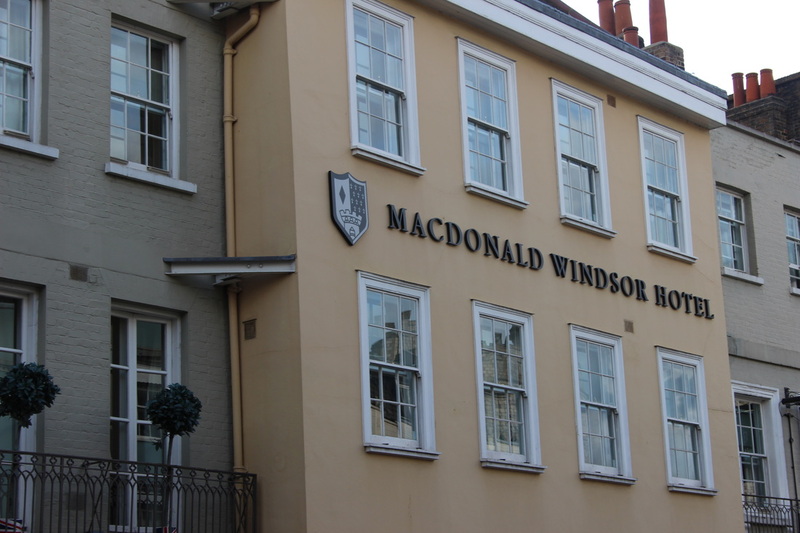 Located in a plum position on Windsor High Street – in fact, bang in the centre of town - the MacDonald Windsor is a top notch place to stay. Directly opposite the Guildhall where HRH Prince Charles married Camilla Parker-Bowles and Elton John and David Furnish celebrated their civil partnership, it is a mere hop, step and jump from Windsor Castle and the iron bridge that links the town to Eton. Our elegant, spacious room with separate lounge area overlooking the High Street and Queen Charlotte Street – Britain’s shortest street - was decorated in calming neutral shades with gray and mink coloured walls, spotlights and monochrome pictures in white frames, while lots of mirrors lent a light, airy feel. Although busy outside, the secondary glazing cut out all traffic disturbance so the room was blissfully tranquil. A huge comfortable bed with marshmallow duvet and massive pillows provided us with a Rip Van Winkle type sleep. 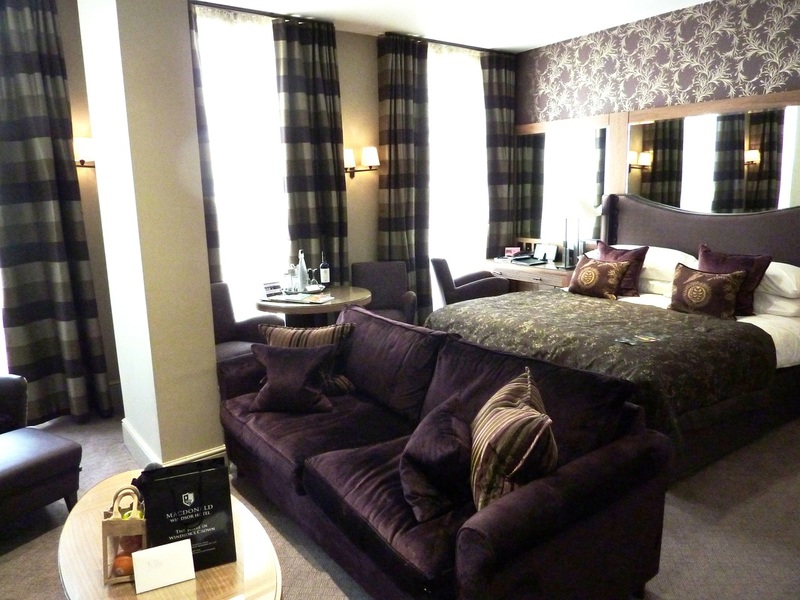 In-room features include Bose iPod docking stations, flat screen television, desk, squishy purple velvet sofa, chairs, masses of velvet cushions and a well stocked hospitality tray. The large ensuite luxury bathroom with bath, walk-in shower and double vanity units came with a sheer abundance of towels and toiletries. An extra plus point is the free wi-fi throughout the hotel. ​Dinner was in the hotel’s Scottish Steak Club @ Caleys which relaunched earlier this year. It was very busy when we were there with locals, families and a group of (rather loud) American tourists. As soon as we were seated, a plate of different varieties of warm bread with accompanying roasted garlic, tomato sauce and balsamic dipping oil was deposited on the table. Tasty nibbles to enjoy while sipping a glass of wine and pondering what to choose from the menu. As far as starters went, delights included tempura battered tiger prawn lollipops, smoked haddock chowder with mussels and sweet corn and fishcakes with caper mayonnaise. Not really sure why I went for the prawn cocktail which was over-sauced anyway, but Mike had the haggis, neeps and tatties with whisky sauce and said it was tasty. And the clue is in the restaurant name when it comes to mains course choices which focus mainly on steak – fillet, sirloin, rib eye, T-bone from Scotland, Argentina and the USA. We learned that all steaks and grills are cooked in the Josper Grill, where natural coals add flavour to enhance the flavour of the food. Mike chose the sirloin which was served with traditional garnish, hand cut chips, grilled tomatoes, flat mushroom and watercress, but as I am not a meat eater, I opted for the battered fish and chips. It was one of the biggest fish I have ever seen and although extremely tasty, I only managed to eat half of it. If you can find room for pudding – we couldn’t – delights include peanut and salt caramel parfait, sticky toffee pudding and Scotch pancakes and maple syrup. Service throughout our meal was efficient, relaxed and polite. At the end of the meal, petit fours are served with Costa coffee. Breakfast in the same restaurant is one of those buffets that persuades you to eat more than you should. Or you can order from a selection of a la carte delights. Whatever you choose, it’s bound to set you up for a hard day’s sightseeing. 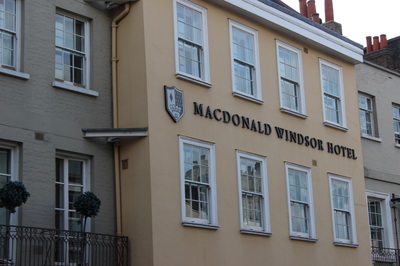 For anyone going to Windsor, I recommend this hotel as the place to stay. Tip: Relax with a coffee in the lounge. With its high backed settles and soft as butter sofas it encourages guests to linger, read a paper, or chat. Lots of candles and knickknacks add an ambient feel, while a welcoming touch is the tray of complimentary non alcoholic cocktails which is regularly topped up during the day.